We’d love your help. Let us know what’s wrong with this preview of What Lurks Below by Donald Firesmith. To ask other readers questions about What Lurks Below, please sign up. A good book. I did find it a bit slow at times especially at the beginning. The action does not start really till past half way through the book. This is a more wet your appetite book. Just as I was really getting into the book ended. I am guessing the next book will pick up from where this one left off. We are told the story from Dr Oswald's perspective, a middle aged geology professor who still takes field work to keep himself active. He is married to an climatologist professor who we are told A good book. I did find it a bit slow at times especially at the beginning. The action does not start really till past half way through the book. This is a more wet your appetite book. Just as I was really getting into the book ended. I am guessing the next book will pick up from where this one left off. We are told the story from Dr Oswald's perspective, a middle aged geology professor who still takes field work to keep himself active. He is married to an climatologist professor who we are told is the more athletic of the two. However we do not see this in this book. Aileen O'Shannon is new to joining the team. A young looking, beautiful, but secretive woman. "I'm afraid we're all likely to come out of this with some degree of PTSD, that is assuming we're lucky to come out of this at all." While preparing for his upcoming classes, Jack Oswald, a geology professor at the University of Alaska Fairbanks, received an urgent phone call from Kevin Kowalski, an ExxonMobil manager, asking him to come and examine the mysterious holes that seemed to have appeared overnight and are threatening the oil company's operations in Alaska's North Slope. Having been tol "I'm afraid we're all likely to come out of this with some degree of PTSD, that is assuming we're lucky to come out of this at all." Having been told to put a team together, Jack Oswald asks his wife and colleague, Dr. Angela Menendez and two of his grad students, Mark and Jill Star to accompany him. Meanwhile, Aileen O'Shannon, a reporter for the Fairbanks daily news-miner, came to interview Mr. Oswald about the baffling craters that have been popping up all over the world. Instead, she overheard his conversation with Mr. Kowalski, and though it was made clear that she wasn't wanted as a member of his team, she included herself on their research trip, and met them at their plane anyway, giving the others no choice but to let her join them. When Jack Oswald and his research team arrive at Deadhorse, Alaska, they're met with the oil company representative, Mr. Kowalski and field biologist, Dr. Bill Henderson. After introductions are made, their camp site put together and their scientific instruments prepared, they begin their investigation. Soon after, though, they are met with a great tragedy, and unfortunately for them, their hardships had only just begun. All hell breaks loose... Literally. I'll admit, when I began reading this story I really thought it was going to just be a thrilling sci-fi, but I was wrong. What Lurks Below has paranormal elements in it as well. While I wouldn't normally think that those two genres could do well together, Donald G. Firesmith does a great job bringing them together and making it believable. I wish that there was a little more information on the "Tutores Contra Infernum" (The Guardians Against Hell). I'm hoping there will be more on the secret society in book two. This book ends on a major cliff hanger, in the middle of chaos, so I'm definitely glad that book two is available. At the end of this book, the author gives a list of the characters, both human and supernatural, along with some added information, which I thought was cool. Overall, this is a fast paced and thrilling sci-fi / paranormal story. What Lurks Below is a fairly short read but it's packed with exciting action and plot twists! I would recommend this to adult readers as there are some graphic scenes (death, injuries, demonic creatures, etc) and some cursing. Hell Holes: What Lurks Below is not in my favorite genre. It is actually in one of my least liked. I tend to find a lot of SciFi-Fantasy gets bogged down with a lot of terminology I don't really know. In trying to figure things out, I tend to come to the conclusion that there are many other books that I could be reading. I decided to read Hell Holes because it sounded interesting and was set in Alaska. I wasn't expecting very much though. I ended up being surprised by a story that held my intere Hell Holes: What Lurks Below is not in my favorite genre. It is actually in one of my least liked. I tend to find a lot of SciFi-Fantasy gets bogged down with a lot of terminology I don't really know. In trying to figure things out, I tend to come to the conclusion that there are many other books that I could be reading. I decided to read Hell Holes because it sounded interesting and was set in Alaska. I wasn't expecting very much though. I ended up being surprised by a story that held my interest. I found myself really being interested in the holes. That was surprising to me. I'm not sure how I feel yet about the demons and such coming out if the holes. I also didn't feel as though I got to really know the characters. There were some deaths but I didn't really dwell on any of them. By the end of the book I did find myself caring about whether or not Jill survived. I think she was the character I attached to the most. The action became nearly nonstop about midway through the book. For the most part this was really good. The ending though, being mid action, left me feeling adrift. I understand that it is the first book in a series. I am hoping we get to know the characters a bit better in the next one. I'm not a big fan of cliffhangers though I usually handle them well. This one left me feeling abandoned in battle. I do hope the author picks it up where we were left. Am I happy that I read this book? Yes, I am. Flawed, (in my eyes), as it is, it did draw me in. Would I recommend it? Yes. Will I read more from this author? Most likely I will come back and read the next book. Have you ever thought about not just climate change, but all the holes we punch into the earth? Could we be destroying the planet we live on…or is there something else happening, something so monstrously evil we cannot ima Hell Holes by Donald Firesmith was everything I had hoped for and more. I really enjoyed this book and cannot wait to start the next one. It was well written and an easy read. Anyone who loves science fiction or horror would love this book. Science,horror, fantasy, paranormal and plenty of action I received a free ARC copy of the book and I voluntarily decided to review it. I am also sharing this review as part of Rosie’s Book Review Team. Hell Holes is an intriguing book and one difficult to classify. Set in Alaska, the prologue already gives us a hint about what is to come, but once we start reading the account written by Professor Jack Oswald, we get taken in by the mystery of the holes, and by the hypotheses suggested, sending u Science,horror, fantasy, paranormal and plenty of action I received a free ARC copy of the book and I voluntarily decided to review it. I am also sharing this review as part of Rosie’s Book Review Team. This is a great wee book! I read the blurb and though it would be an exciting, yet still scientific read and the author did not let me down. It was great to see science, adventure, exploration and a bit a fantasy. It's a very thrilling read as well. With all those bits thrown together, it is a book you are worried won't meet the very high expectations you have for it, but this book and author have done very well to hold up their end and really make this book everything it claims to be and a bit This is a great wee book! I read the blurb and though it would be an exciting, yet still scientific read and the author did not let me down. It was great to see science, adventure, exploration and a bit a fantasy. It's a very thrilling read as well. With all those bits thrown together, it is a book you are worried won't meet the very high expectations you have for it, but this book and author have done very well to hold up their end and really make this book everything it claims to be and a bit more! I liked the pace the book was set at. It really built up the excitement and kept the thrilling sections to a point where you were kept on your toes. It did also allow for a lot of the detail to show through, which was perfect. This is really where it kept up its scientific part for me. The level of detail it put into the surroundings and happenings was perfect. I would always be happy with a bit more, but I love science. It think it was a healthy amount, to make readers like myself happy and excited, but still be very enjoyable for those who aren't fans of a lot of scientific terminology in their books. Overall, the characters and detail in the world really created a book that was very interesting to read. It did keep my attention until the very end and I found it both exciting and thought provoking. It is a great read and one I recommend. Dr. Jack Oswald is a geologist at the University of Alaska in Fairbanks. Just before classes are ready to begin for the semester, Jack receives an urgent call from Kevin Kowalski who works for ExxonMobil drilling oil. There have been a series of mysterious holes opening up around the drilling fields that are affecting operations. The holes are deep and perfectly cylindrical and just plain strange. Jack has been hired to investigate; he assembles his team consisting of his wife, Dr. Angela Menend Dr. Jack Oswald is a geologist at the University of Alaska in Fairbanks. Just before classes are ready to begin for the semester, Jack receives an urgent call from Kevin Kowalski who works for ExxonMobil drilling oil. There have been a series of mysterious holes opening up around the drilling fields that are affecting operations. The holes are deep and perfectly cylindrical and just plain strange. Jack has been hired to investigate; he assembles his team consisting of his wife, Dr. Angela Menendez, a climatologist, two of his grad students Mark and Jill Starr, a wildlife biologist Bill Henderson and is cajoled into taking along AIleen O'Shannon, a photojournalist. When the team arrives in Deadhorse, they immediately get to work exploring the holes. However, upon closer examination of the holes, no explanation for the holes can be found. Then, disaster strikes and all hell is literally unleashed. Now, the research team turns instead to survival and perhaps sending the demons back to where they belong. This was a fast-paced and short read that managed to combine climate science and supernatural horror in an effective way. The book is written from Jack's point of view as a memoir of a survivor the attacks. The first part of the story is a bit of an info dump as Jack's explains what he does, describes the fieldwork and his team's hypotheses about the holes. As a scientist myself, I enjoyed reading about permafrost and pingos and liked that climate science is featured in a book. The story quickly picks up as hell breaks out on Earth. One character has a large surprise up their sleeve that may help the team out of the mess if they can accept their new reality. The different demons were all very interesting and I wish Bill could have continued his post mortem of the Hellhound. Since this is a memoir of events, there is not much characterization, but more focus on events. The story ends on quite a cliffhanger and with a sneak peek of book two at the end, I will definitely want to read on. The cover is pleasingly stark. I didn’t even notice the little man scaling down the side until I’d opened it up to a non-thumbnail size. It quite nicely fits this story, which is an unusual blend of modern science (no, I didn’t forget to put the word fiction after science) and fantasy. Hell-Holes read quick and easy, and at 108 pages, for someone who reads at an average speed, it should give you a couple hours of enjoyment. I loved the premise and the way this book was written for the most part. The cover is pleasingly stark. I didn’t even notice the little man scaling down the side until I’d opened it up to a non-thumbnail size. It quite nicely fits this story, which is an unusual blend of modern science (no, I didn’t forget to put the word fiction after science) and fantasy. Hell-Holes read quick and easy, and at 108 pages, for someone who reads at an average speed, it should give you a couple hours of enjoyment. Disclaimer: I received a copy of this story free from the author in exchange for an honest review. This book is a mish mash of genres, from science, to fantasy to horror. So the story is about a group of scientists who have to investigate large holes that haver appeared from nowhere in Alaska. Jack the main character goes with his wife and two grad students along with a journalist. And so the story begins. Once they arrive and settle in things start to happen. The book is fast paced once the fantasy aspect kicks in and it’s a bit of a shocker how the story quickly changes genre. I love love fantasy so for me I loved it. There is plenty of action and scares in the story also, the author covers a lot of different genres but it works. Geology professor, Dr. Jack Oswald, his wife Dr. Angela Menendez, and grad students, Jill and Mark Starr, are suddenly called to investigate a bizarre phenomenon in the Arctic Circle. Tagging along with them is a beautiful young photojournalist named Aileen O’Shannon. When they arrive at the location, the group sees for themselves a massive hole which had appeared overnight. It isn’t long into their investigation that things go to pot very quickly. What they find is the last thing anyone of them Geology professor, Dr. Jack Oswald, his wife Dr. Angela Menendez, and grad students, Jill and Mark Starr, are suddenly called to investigate a bizarre phenomenon in the Arctic Circle. Tagging along with them is a beautiful young photojournalist named Aileen O’Shannon. When they arrive at the location, the group sees for themselves a massive hole which had appeared overnight. It isn’t long into their investigation that things go to pot very quickly. What they find is the last thing anyone of them had ever expected—with the exception of O’Shannon, who is much more than she leads people to believe. Which is good for them, ‘cause the group will need her assistance and skills if they’re to survive what’s coming for them and everyone else on earth! This book was a fantastic read. I like any story that I can easily see being a movie or TV show. Aileen O’Shannon is an interesting character, who has a very intriguing past that I hope to learn more about in the next installment. I recommend this book to anyone. I love unexplained acts of nature. Makes for such a chilling plot. 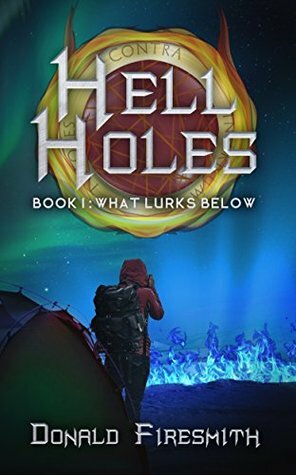 When holes start appearing in the Arctic Circle , a team of experts is sent to investigate. Once they arrive, things get worse as more holes appear. And then something straight out of Hell crawls out. A horde of otherworldly creatures that have only one thing in mind. Killing mankind. With nowhere to run, the team seeks shelter in an old station. But the horde won’t be denied, and like an octopus with a sealed bottle full of yumm I love unexplained acts of nature. Makes for such a chilling plot. When holes start appearing in the Arctic Circle , a team of experts is sent to investigate. Once they arrive, things get worse as more holes appear. And then something straight out of Hell crawls out. A horde of otherworldly creatures that have only one thing in mind. Killing mankind. With nowhere to run, the team seeks shelter in an old station. But the horde won’t be denied, and like an octopus with a sealed bottle full of yummy bait, they will find a way in. There’s a mixed bag of character’s. Ones you come to like and respect and some not so much. The author doesn’t seem to mind killing off either one. Keeps you on edge when things get down and dirty. Which doesn’t take long at all. The story is strong and there’s a sub plot that makes things even more interesting. Also, the blend of science fiction and horror leaves the story wide open for the author to go in many different directions. Won this in the giveaways with another small quick read book and I have to say that I have enjoyed the smaller books because I feel accomplished when I get through them in a few days or in one sitting. I was impressed with the book and my only complaint is that some of it after the half way mark felt a little rushed but other than that it was a good read! Dr. Oswald is from No. California would be read as Drive, Oswald is from no California. Mrs. was mrrs and Mr. was mrr. At first I kept wondering why the person telling the story kept telling Oswald to drive, especially since they weren't in a vehicle most of the time. I wasn't looking at the print version on the computer at that point. Anyway, the story is about group of people that were sent to Alaska to investigate some huge holes that were appearing in the permafrost; a geologists, a climatologists, two geological grad students, a Exxon Mobil management employee to see if the North Slope oil fields were in danger, and a woman that claimed she was a photographer for a newspaper. What they found cost the lives of two members of the group and left the others traumatized. The Alaskan permafrost had much more in it than holes. I read the blurb of this book and knew I had to immediately read it. Set in Alaska, there is a huge hole that appears suddenly that could conceivably cause trouble to the nearby oil field and pipeline. A team of scientists is quickly deployed to find out the cause of the phenomenon. The team arrives quickly but already hundreds of holes are opening up. From this point, the characters scramble at a breakneck pace for safety as unnatural creatures spew forth amid noxious gas and tectonic quakes. T I read the blurb of this book and knew I had to immediately read it. Set in Alaska, there is a huge hole that appears suddenly that could conceivably cause trouble to the nearby oil field and pipeline. A team of scientists is quickly deployed to find out the cause of the phenomenon. The team arrives quickly but already hundreds of holes are opening up. From this point, the characters scramble at a breakneck pace for safety as unnatural creatures spew forth amid noxious gas and tectonic quakes. The team’s priority becomes staying alive in the isolated far north. There's a touch of Mathew Reilly about it but with a Dan Brown style hero/narrator and a Micheal Crichton level of research. People who know me might think that the mention of Dan Brown is a thinly veiled insult but it really isn't. Dan Brown is very good at some of the things he does and Donald G Firesmith ma I have a fondness for stories in which it is revealed that the world is not as it seems. This is one of those. If you also like those kinds of stories then you will probably like this one. There's a touch of Mathew Reilly about it but with a Dan Brown style hero/narrator and a Micheal Crichton level of research. People who know me might think that the mention of Dan Brown is a thinly veiled insult but it really isn't. Dan Brown is very good at some of the things he does and Donald G Firesmith manages to emulate those while avoiding the inept pop culture references, laughable research and lazy sentence structure that make me want to smack Dan Brown upside the head. When I first started reading What Lurks Below started out slow like and it was kind hard to get into. It starts out reading like a textbook and I was like I didn't sign up for this. But I kept reading telling myself to come on give it a chance you just got started. So I kept reading and then the next thing I knew the words were exploding off the pages at me and I was racing through it. Dr. Oswald a professor at the University of Alaska Fairbanks gets a phone call from a Mr. Kowalski asking for h When I first started reading What Lurks Below started out slow like and it was kind hard to get into. It starts out reading like a textbook and I was like I didn't sign up for this. But I kept reading telling myself to come on give it a chance you just got started. So I kept reading and then the next thing I knew the words were exploding off the pages at me and I was racing through it. Dr. Oswald a professor at the University of Alaska Fairbanks gets a phone call from a Mr. Kowalski asking for his help up on the North Slope near the Trans-Alaska Pipeline. There are these big wholes opening up all over the place which could spell disaster for the oil companies if they don't figure out real quick like what is going on and try to put a stop to it. Dr. Oswald gathers up his team which includes his wife Dr. Menendez two students, Mark Starr and his wife Jill Starr and head out for the oil fields. They get themselves a new crew member along the way one photographer Aileen O'Shannon a very attractive young woman who finagles her way into their expedition that has the wives of the two men keep close eyes on this one so she don't forget that their husbands are off limits. As I said What Lurks Below did take off on slow start but once they reached the first gigantic hole it was on then. More holes started popping up all around them taking all their vehicles and campsite and things coming out of it like you wouldn't believe. They all took off like the demons from hell were coming up out of those holes. The characters adrenaline was pumping but so was mine. The words started popping off the page hitting me in the face the moment the explosions started and I could just feel the heat coming off them. It was as if I was right there with all the characters running for my life with the demons and heat from the explosions on my heel wondering if we were going to make it out alive. The summary for What Lurks Below does not in any way do this book justice at all. What Lurks Below is filled with so much action adrenaline pumping and horror that it will have you sweating way before it is over. I liked the scientific elements of this book, it was interesting to learn what they were talking about in regards to global warming, sinkholes and what not. It also showed the Author had put in the time to do his research. It was short but it felt like the right amount of pages, you could tell the first was just an introduction to the rest of the series. Highly interested in carrying on reading. Demon apocalypse seems like an interesting story concept. The story leaves you going oo what going to I liked the scientific elements of this book, it was interesting to learn what they were talking about in regards to global warming, sinkholes and what not. It also showed the Author had put in the time to do his research. It was short but it felt like the right amount of pages, you could tell the first was just an introduction to the rest of the series. Highly interested in carrying on reading. Demon apocalypse seems like an interesting story concept. The story leaves you going oo what going to happen? Do they survive? Do humans survive? I give this 3.5 stars. Well, wasn't this a complete surprise package! It just goes to show that you should never judge a book by its cover. After reading reviews as to what this novella would be genre wise, I tend to disagree that it's science fiction. To me it felt more like a horror/paranormal/thriller and kept you on the edge of your seat as to what would happen next. Written rather like a journal from the male protagonist's point of view, the writing was smooth and the characters quite lifelike I give this 3.5 stars. Written rather like a journal from the male protagonist's point of view, the writing was smooth and the characters quite lifelike. It did get a bit heavy on the technical side but this was really needed to back up various theories for the existence of the holes. I won't say anymore as it would give spoilers away, suffice to say I'll be reading the next novella in the series which looks to be from the female protagonist's point of view. Well, the first 3 chapters weren’t too engrossing . And you won’t probably read Donald Firesmith’s stuff for a couple of days . But you should give his work a second try . After the first 3 chapters, the book starts gathering up a lot of gravity and the book sorta pulls you inside its own unique universe.The book finishes with an Ellipsis in your brain. Once you have completed the book , you can not stop marvelling the ideas put forth by Donald Firesmith. Hell Holes, Book 1 is an AWESOME read!! This book surprised me on where the story went. it was full of excitement and gore. I was shocked throughout the story. The author has a vivid imagination and you will be entertained w it’s this book. Wow! Such an exciting and well-written book! I did not want it to end. Now I want to read everything this author has written! Seriously good book here, I hope you enjoy it as much as I did. Happy reading! I am not really into fantasy/sci-fi type books (more of a murder/mystery type.) Stumbled onto Hell Holes #1 and I am looking forward reading #2. Good, fast read. It's a story about a group of geologists that is called tho investigate the massive appearance of holes affecting the zone of the Alaskian oil pipeline. During their investigation, they are confronted with the loss of people of their team due to the surging of demonic creatures that emerge from these precise holes they're investigating. The book starts with the scientific development of the information about the effect that those holes could have on the environment, to soon develop the shocking t It's a story about a group of geologists that is called tho investigate the massive appearance of holes affecting the zone of the Alaskian oil pipeline. During their investigation, they are confronted with the loss of people of their team due to the surging of demonic creatures that emerge from these precise holes they're investigating. The book starts with the scientific development of the information about the effect that those holes could have on the environment, to soon develop the shocking truth about what's happening. The plot is very well developed, creating tension slowly as the story unfolds. The scientific description is exhaustive for the reader to understand the environmental implications of the phenomenon of the holes. With the emerging of the diverse demonic creatures, the story gets more and more intensity due to the fight of what remains of the original team not only to save themselves, but to stop these creatures to take over the world. Let me get this out of the way first-for some reason when I downloaded the book, I thought it was going to be about Tremors style giant worms underground and coming to eat people. I'm not sure exactly where I got that idea so I was kind of disappointed to see what actually came out of the holes! Now that is purely my fault for getting an idea in my head, not the fault of the book or author for giving a wong impression, because they didn't! Is that all cleared up? Good, then we can move on to the Let me get this out of the way first-for some reason when I downloaded the book, I thought it was going to be about Tremors style giant worms underground and coming to eat people. I'm not sure exactly where I got that idea so I was kind of disappointed to see what actually came out of the holes! Now that is purely my fault for getting an idea in my head, not the fault of the book or author for giving a wong impression, because they didn't! Is that all cleared up? Good, then we can move on to the actual review of the book and forget Chuckles stupidity! Jack is a geologist and he is called to investigate why huge holes are appearing all over Alaska with no warning, threatening the pipelines in the area and the people who live and work there. Jack and his student Mark lower themselves into one of the holes to have a look around but the gas levels are dangerously high and a quick retreat is needed. However, a preventable accident then occurs which blows up the entire area...and from the holes in the ground comes the deadly demonic hellhounds to the shock of the explorers. It is then up to one team member to save them from the hellhounds and explain the danger that the entire world is in from demonic invasion. OK lets deal with the characters now. Jack annoyed me right at the start with the cliche of man turns into gibbering wreck at the sight of a beautiful woman even when his wife is right there with him. He allows Aileen, a stranger claiming to be a photographer to just tag along on the trip, no doubt because of her looks. When they land in Alaska, Bill the wildlife biologist and expedition organiser Kowalski are fawning over her like slobbering dogs. The fact that the woman has to use her feminine charms to get her way over dumb men with their brains in their pants is a cliche that does really annoy me in books. It made me dislike Aileen straight away. Luckily, after disaster strikes, Aileen reveals that she is on the trip because she recognises the hell holes for what they are and talked her way onto the trip to get a look at the area to confirm it. She is part of an order that looks for demonic activity and tries to stop it, starting with saving them from the first hell hounds. Aileen explains that this will be followed by deadly imps and gargoyles and a full scale invasion from hell, which of course scares the group to death. Now they have to escape Alaska and all the demons and try to stay alive. By this point I had reformed my opinions of the characters, including Aileen and the idiot that is Kowalski. For someone who works around pipelines his gross stupidity for safety issues was quite shocking. The group dynamic actually becomes quite good after we learn what is lurking under the ground. It did take a bit of time for it to get in to the main point of the story. It was 30% of the way in when the men started to explore the hole. I wouldn't say that it was slow, more that I was impatient for it to get going. I'll be honest-if it had taken any longer for the exploration to start, then I might not have continued to read. However it did start then, and after that, the story certainly kept me interested. It was a bit technical in the early part of the book with details about methane, climate change, permafrost and pingos(?) that I could personally have done without but I guess the author was trying to give some background information to the reader. I thought pingos were the nickname for those black and white winter birds with long beaks but who knew! Once the story got going, I found it very interesting. I've always liked demons in my horror and urban fantasy reads so the actual story about demonic invasion was interesting. The tension was built up nicely as they tried to hide from the first wave of demons, creeping through a dark building where they could pounce at any time. I grew to care about the characters and not want anything to happen to them. It was also nice to see the men not knowing what to do and looking for the female expert to come up with the plans. I liked the different dangers that each type of demon brings as their dangerous journey continued. After the initial scientific info dump, i didn't find it over descriptive. The story flowed along nicely and there were plenty of demons to keep things interesting. For those who are interested, there was no real sexual content other than men drooling. I can't really comment fully on bad language as I have nothing specific in my notes about it but I'm sure there was some. There are of course scenes of injuries and death. The monsters are a bit scary for younger readers so I recommend this to adults and older teenagers if they like the genre. There is a pretty big cliffhanger at the end and you will need to read the second book to resolve that. I do intend to read on when I get the chance. This is the first episode in an ‘intelligent adventure’ series (‘Hell Holes’), which mixes the heft of heavyweight geology and climate science with the demons of the underworld unbound, in all their slavering ferocity. It’s a genre-bending bonanza of science, speculative fiction and supernatural action, a nifty idea which would make a perfect movie pitch. Think Jurassic Park but with wolven hellhounds taking the place of the velociraptors, and a sky full of giant flying demonic bat-monsters. As This is the first episode in an ‘intelligent adventure’ series (‘Hell Holes’), which mixes the heft of heavyweight geology and climate science with the demons of the underworld unbound, in all their slavering ferocity. This feels like an indie author’s early work, and it shows in the writing. In the early chapter it leans heavily on big lumps of background information, where the serious-sounding science is delivered in meaty lectures. Then the tone changes dramatically as the supernatural angle kicks in, and the more unfortunate members of the team fall as sacrificial red shirts to various voracious beasts. A geek by day, Donald Firesmith works as a system and software engineer helping the US Government acquire large, complex software-intensive systems. In this guise, he has authored seven technical books, written numerous software- and system-related articles and papers, and spoken at more conferences than he can possibly remember. He's also proud to have been named a Distinguished Engineer by the A A geek by day, Donald Firesmith works as a system and software engineer helping the US Government acquire large, complex software-intensive systems. In this guise, he has authored seven technical books, written numerous software- and system-related articles and papers, and spoken at more conferences than he can possibly remember. He's also proud to have been named a Distinguished Engineer by the Association of Computing Machinery, although his pride is tempered somewhat by his fear that the term "distinguished" makes him sound like a graybeard academic rather than an active engineer whose beard is still slightly more red than gray.